Before the inevitable announcement of the signing of both Bryce Harper and Manny Machado by the Phillies (ahem), I wanted to catch up on a few recent departures. Super utility player Pedro Florimon joined the Braves on a minor league deal. 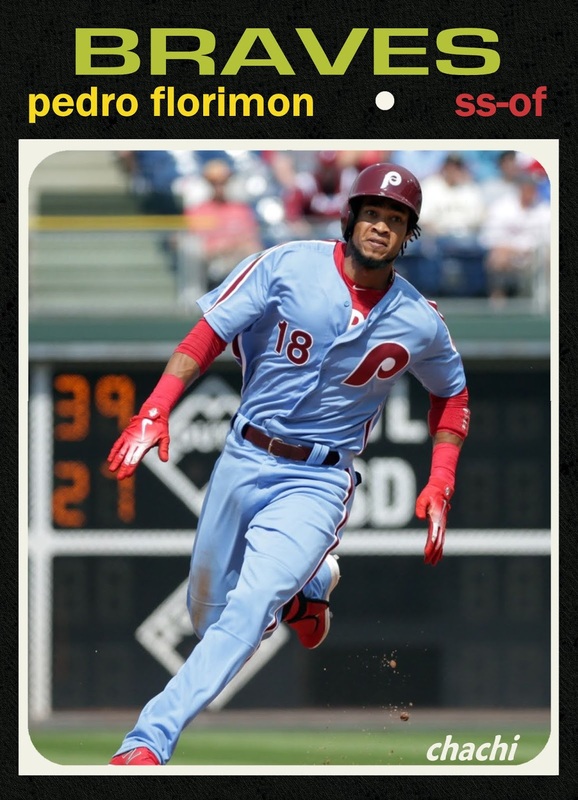 His official Phillies cards can be found in both team issued photo card sets from last season, and he's also erroneously portrayed on the 2017 Topps Now Players Weekend card for Nick Williams. 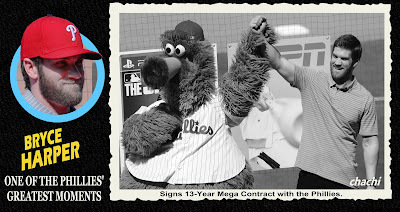 A quartet of short-time Phillies officially moved on as well with Justin Bour signing with the Angels, Wilson Ramos and Luis Avilan going to the rival Mets and Asdrubal Cabrera headed to the Rangers. 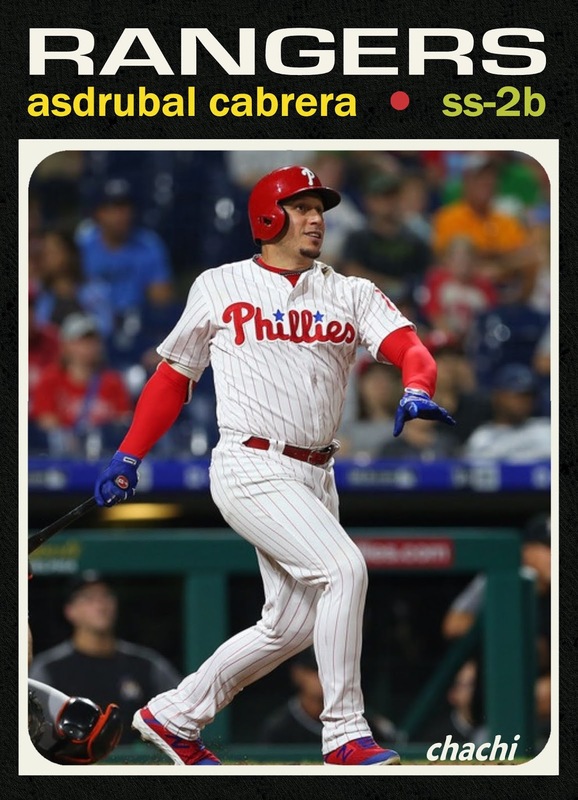 All four appear in the late season team-issued photo card update set, and Ramos and Cabrera also appear as Phillies in the Topps update set. I've updated the Moving On list below for these moves and I'll present here the full Chachi checklists for these departed players as a final tribute. Trevor Plouffe - inf (10/4/18) - Elected free agency. Jose Bautista - of (10/29/18) - Elected free agency. Asdrubal Cabrera - inf (10/29/18) - Elected free agency, signed with the Texas Rangers on 1/24/19. Aaron Loup - lhp (10/29/18) - Elected free agency. 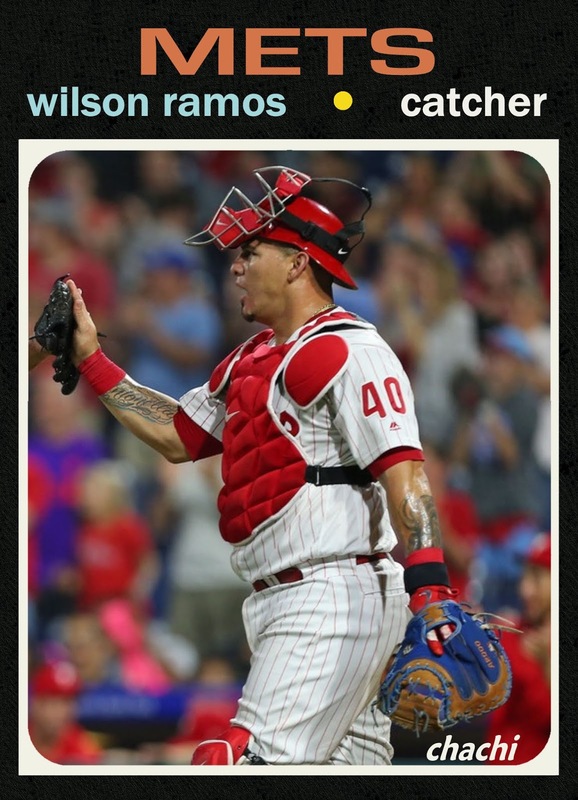 Wilson Ramos - c (10/29/18) - Elected free agency, signed with the New York Mets on 12/18/18. Pedro Beato - rhp (11/2/18) - Elected free agency. Jesmuel Valentin - inf (11/2/18) - Elected free agency. Pedro Florimon - inf/of (11/3/18) - Outrighted off 40-man roster, elected free agency and signed as a minor league free agent with the Atlanta Braves. 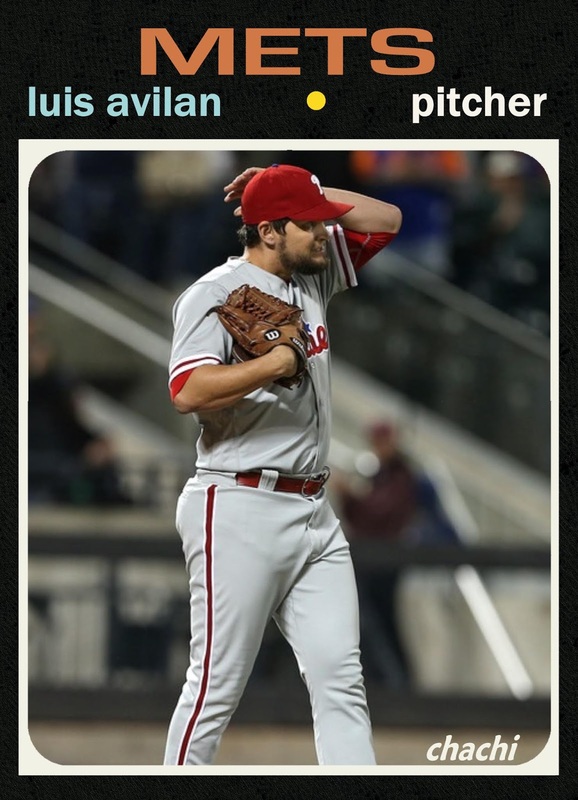 Luis Avilan - lhp (11/30/18) - Non-tendered, becoming a free agent, signed as a minor league free agent with the New York Mets on 1/10/19. 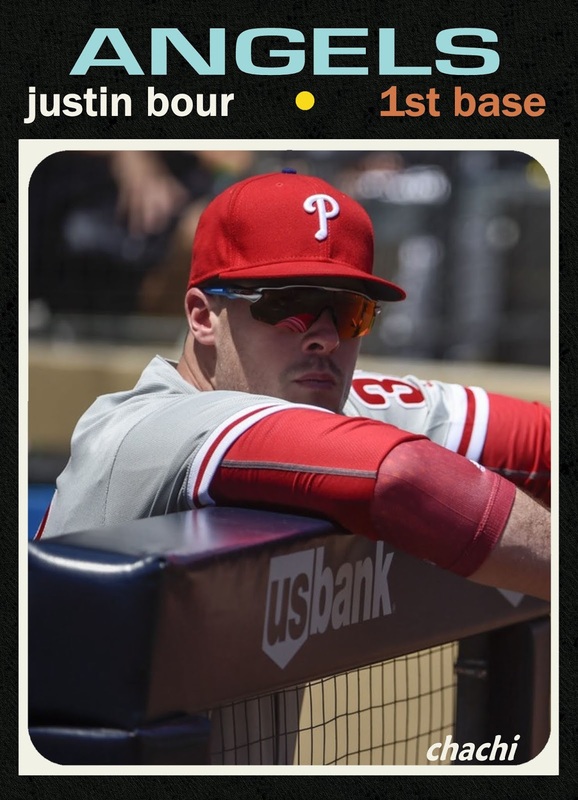 Justin Bour - 1b (11/30/18) - Non-tendered, becoming a free agent, signed with the Los Angeles Angels on 12/15/18. Carlos Santana - 1b and J.P. Crawford - ss (12/3/18) - Traded to the Seattle Mariners for James Pazos, Juan Nicasio and Jean Segura. Luis Garcia - rhp (12/6/18) - Traded to the Los Angeles Angels for Jose Alvarez. James Pazos - lhp, Juan Nicasio - rhp and Jean Segura - ss (12/3/18) - Acquired from the Seattle Mariners for J.P. Crawford and Carlos Santana. Jose Alvarez - lhp (12/6/18) - Acquired from the Los Angeles Angels for Luis Garcia. Andrew McCutchen - of (12/12/18) - Signed as a free agent formerly with the New York Yankees. David Robertson - rhp (1/3/19) - Signed as a free agent formerly with the New York Yankees. Labels: (Tribute), 1971, 2019 Chachi Set Inserts, Avilan, Bour, Cabrera, Florimon, Ramos W.
Are your Chachi sets available? 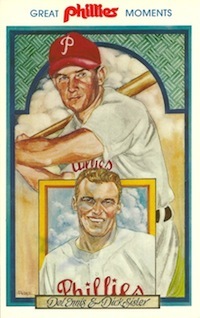 If you are able to make cards, I would be interested in buying a number of guys who appeared for the Phillies cards who do not have their own Phillies cards. Hi Brennan. I haven't made them available, but I know a number of collectors who have printed them directly from my blog. I'm not savvy enough to figure out the correct print settings, but if you resize the files to 2 1/2 x 3 1/2 and print on either matte finish photo paper or thicker paper stock, that should do the trick!